Image caption Protesters are calling for the end of the "Gnassingbé dynasty"
Tens of thousands of people have marched through the streets of Togo's capital, Lomé, protesting against President Faure Gnassingbé. He became president after the death of his father, Gnassingbé Eyadema, who had been at the helm for 38 years. Protesters are calling for the end of the "Gnassingbé dynasty". "Even in most developed countries, authorities take control of telecommunications in some cases," he said. BBC Afrique's Ata Ahli Ahebla reports that demonstrations took place in many cities and that more are planned for Thursday. He adds that the decision by the cabinet to propose a constitutional change to bring about a presidential term-limit has not changed the protesters' plans. They see it as part of a ploy to extend Mr Gnassingbé's rule. 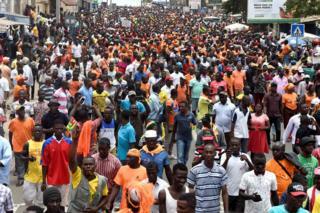 Amnesty International estimated that 100,000 people marched in Lome, many wearing the red, orange and pink colours of opposition parties as they chanted "Free Togo". "We suffer too much, we can't even find food. What country are we in? We don't want Faure any more, he must go," he said. They chanted: "50 years is too long".